You are here: Home / Article Knowledgebase / Failure in Gem Therapy Case Study-Usage of Diffused Thermally Enhanced Thai Yellow Sapphire & Zero Astrological results. Failure in Gem Therapy Case Study-Usage of Diffused Thermally Enhanced Thai Yellow Sapphire & Zero Astrological results. Thai Blue and Thai Yellow Sapphire/Kanchanaburi Yellow Sapphire( Also sold in the pseudonym of Kanaka Pushya Raga, diffused and heated does not work for Jyotish Purposes. This write up is for all those who send us mails on similar lines. Gem therapy in the realm of Planetary Gemology is a very potent remedial tool that can aid in coaxing the karmic life map to unfold much to an individuals advantage. However, as potent as it might be, challenges appear out of the blue when an individual sets out in a positive direction. This phenomenon is nothing new, nothing unfamiliar to most people. Have you ever noticed how problems and hurdles crop up out of nowhere as soon as you venture out to do something that is really worthwhile and can be significantly beneficial for you? Have you suddenly fallen ill, faced expected or unexpected opposition and hostility, experienced difficulty in a different aspect of life, something that obstructs your normal functioning, or fallen prey to self-doubt and scepticism? Altering the Karmic life map isn’t easy and fate throws up numerous challenges in your face to determine how much mettle you have, how tenacious you are or are you really worthy of being allowed to bypass karmic retributions originally planned for you! So even if you have resources in front of you, it may still be a tough ride to circumvent the unrelenting grip of fate. There are many of our clients with completely noble and respectable intentions but who end up losing time money and direction, caught up unwittingly in this warp. Here is a example of a young person, who decided to buy the engine separately (read gemstone), chassis separately(read jeweller), sundry parts separately (read nuggets of information acquired randomly, the veracity of which is deplorable), assemble it together and then seek opinion from us why the solution was not giving the desired results! Notwithstanding this mish-mash mix, there was clear communication sent back and forth each time to this client who, however due to some reason could not hear the voice of reason and kept holding on to a fragile twig each time. Here is the mail trail for you to follow and understand how the mind clouds out, even the simplest pieces of good information, when fate denies the opportunity for remedy. Doubting Thomas needed to experience the wound before he believed! And sometimes individuals need to go through fire before they can see light. Communication with a Client who implemented Therapy with a poor quality heat treated Sapphire similar to the video above and got zero results. See the communication, check his certificate and never let such kind of a thing happen to you. Some areas have been blanked out to protect privacy. DKIM Signature above for those interested. Hi. I have worn the gemstones prescribed by you for almost 3 years, but there hasn’t been any movement in my career. I bought the most expensive gemstones I can afford from a reputed jeweller. I am trying to get into fashion photography but have not made any headway as yet. I look forward to you suggestions. Moreover I’ve got my name changed from xxxxx (vvvvvvv was an experimental name) to xxxxxxxx just recently in my legal documents. Client specifies that he is wearing most expensive Gemstones.? He specifies that these have been from a reputed jeweller.? Thank you for mailing Gemstone Universe. Regret to inform you that we cannot say anything till we see the physical samples or the certificates. Kindly scan the certificates across. Hi. 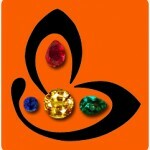 I am afraid I don’t have the certificate with me but the stones were certified by gemology institute of India. I can assure you that I am wearing good quality original stones. It’ll be great if you could suggest something else. Thank you for mailing Gemstone Universe. Cannot say anything tangibly in absence of concrete data!. However we receive queries similar to your around 2-3 times in a month. We have decided to address this issue in the blog. You can expect a post on this in the next two weeks. Client Says Gems are of good quality certified by GII but does not have the certificate.? Client has gone on a tangent other than original communication and wants some alternate solution.? Hi. Thanks for your reply to my query…just wanted to know what else I need to do to have a more favourable time. All my effort to get my career on track is going down the drain. I’ll send you scan of the certificate soon. Also I wanted gem prescription report for my mother, but she doesn’t have her birth details. Client still wants an alternative solution. Now says shall scan the certificate across. Hi. I got it tested from a lab in Lajpat Nagar. The stone was in the ring when they tested it. I don’t know what you’ll think of this report. This is the most I can do. I can’t send it to a gemology lab in Mumbai. It’s found to be an authentic natural sapphire. It should have worked to some extent. Gem Report Sent by the Client that clearly specifies that the Gem is Thermally enhanced. even Mud on earth is natural. The Lab should always test for treatment! 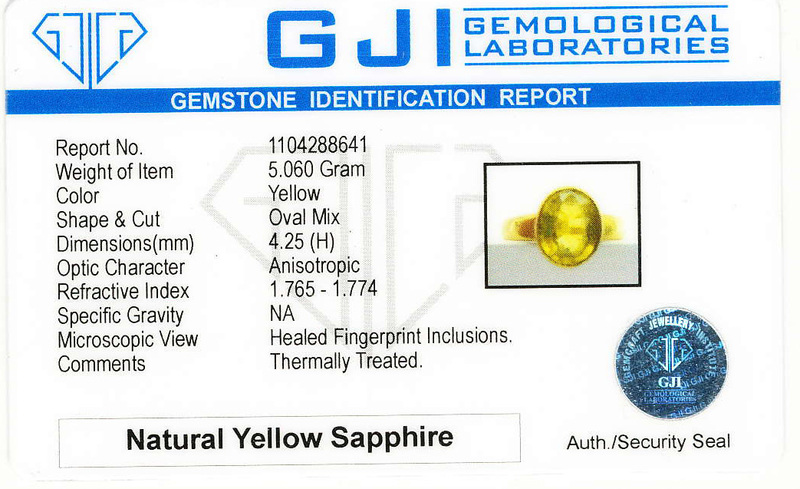 Client who said in the first communication that his Gem is certified from GII and procured from a reputable jeweller now gets it certified from a 3rd lab and sends his certificate that clearly states that it is a thermally treated Sapphire but still continues…… Check his own certificate below. He wants to know what we at Gemstoneuniverse think of this report. Client”s sapphire is Thermally enhanced Sapphire Clearly Stated by the Lab. Please click the link below to know more about what exactly a Jyotish Quality Gemstone is and never compromise on your Gem Quality. 1) Lab does not have equipment for the same. 2) Individual sending the sample has especially not requested further information. CE(LG) Clarity enhancement by heating: processed with lead(Pb) and other chemical elements-bearing glass in fissures and/or cavities. The unmounting is recommended in case of jewelry repair as heat, chemicals, and other factors may damage the stone. RGC Extensive clarity enhancement by heating: significant amount of lead(Pb) and other chemical-bearing glass in fissures and/or cavities forming a composite. The unmounting is highly recomended in case of jewelry repair as heat, chemicals, and other factors can easily demage the stone. CE(GR) Clarity enhancement by heating: fissures of the stone are filled with non-lead(Pb) chemical elements-bearing glass and/or substances solidified with re-crystallized corundum (“residues”). CE(C/F) Clarity enhancement by heating: glassy foreign substances which can be dissolved by hydrofluoric acid are completely and/or partially filling a cavity/cavities. The “residues” (see above) are also within fissures. ECE(C/F) Extensive clarity enhancement by heating: large undesirable cavities are completely filled with glassy foreign substances (see above). Fractures and fissures are also significantly filled with “residues” (see above). HTLE Colour enhancement by heat treating with light elements such as beryllium, lithium, boron, etc. The resultant colour is permanent. From the picture it is a clear HTLE Color stone heated with beryllium. We hope that this mail addresses your queries. In case of any questions or comments please do not hesitate to e-mail us. This Jeweller was not reputed but a quack. See the reply above why treatments are not disclosed in the certificates and avoid such bogus Gems, certificates and jewellers. Hi. I can’t really trust the report of that lab, nor do I expect you to do it. I can send the gemstone with the ring for you guys to have a look at it. I can bet you that it’s a good quality stone. It has been enhanced to look attractive but not ‘thermally enhanced’. You can make your own observations dear patrons on this one! Thank you for mailing Gemstone Universe. Enhancement means Gem does not qualify to be Jyotish Quality. At Gemstoneuniverse we have a policy of not examining, appraising or giving our opinion on 3rd party goods. If the Lab from which you have got it certified does not inspire trust in you, request you to engage services of one that does. At Gemstoneuniverse we believe in service to planetary Gemology, delivering great solutions that work and doing good quality work. Even though all the information that empowers you to implement Gem therapy correctly is there on the website, still we receive communication similar to the above wherein individuals implement therapy incorrectly. We hope this post shall cut down this communication and we shall be able to deliver more time to those individuals who are really passionate about Gemstone Therapy and who understand that import of the Karmic Life Map and to planetary Gemology.